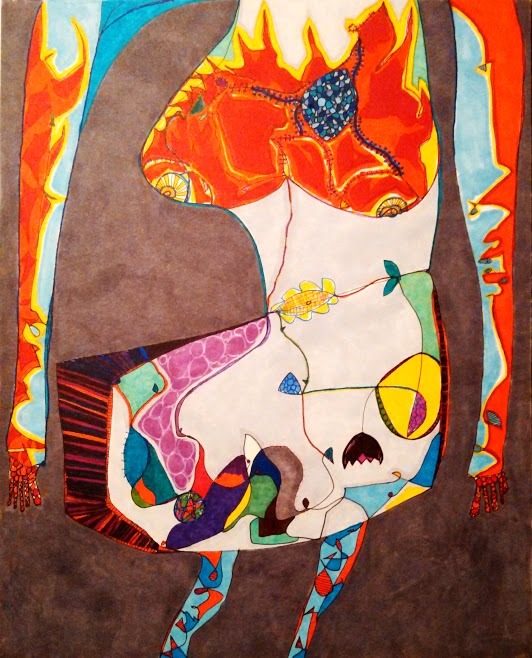 “Body with Fire” by Laura Didyk, Sharpie on paper, 2015. Wide awake and nervous about my approaching medical appointment, I wandered into the bathroom at four in the morning. Through the window, I saw three moons. The one in the center was a storybook moon. It was so large and bright that I could clearly see the topographical features. There was another moon on each side of it, perfectly spaced, but each of them smaller and less vivid. Quickly I found my glasses and looked again. Yep. Three moons. The sky was a deep pre-dawn blue. The river birch, decorated with new leaves, looked silver in the moonlight. A slight breeze stirred the curtain. The young leaves on the birch shivered and so did I.
Oh God, I thought, breaking into a sweat. I’m having a stroke, or some kind of neurological event. I woke Mike and pulled him by the hand into the bathroom. By taking a step to the right, I discovered that three moons shone through the left pane of glass, but only one, the big, bright moon, shone through the right. I concluded that it was some sort of optical illusion, produced by the bathroom mirror and who knows what scientific process. But I stood for a long time, looking at the three moons. Over the next few days, things happened quickly. After ten years of living with cardiomyopathy, my heart function had dropped again and was dangerously low. I was in atrial fibrillation and my heart was dancing a strange little dance all its own. On the heart monitor, the line ran in irregular peaks and valleys like a piece of modern art. Eventually they moved me to the cardiac ward and attempted to shock my heart back into rhythm. “It didn’t work,” they told me when I woke up. Finally, late in the afternoon, they geared up to try it again. This time I was truly and deeply frightened. I tried to distract myself by singing “I Got Rhythm” in my head. This time, my cardiologist adjusted the patches himself. “Deep breaths,” he said. When I came to, the nurse’s face swam in and out of focus, but she was smiling. “It worked,” she said. I burst into tears. “What’s the matter, honey, I said IT WORKED,” she said distinctly. Back in my bed, I watched the heart monitor. It beat in a steady rhythm. Before I left the hospital, my favorite nurse, Bernie, instructed me in administering shots of blood thinner to myself. I have had a phobia about hypodermic needles as long as I can remember. She waved the needle in front of my face. “See how little and thin it is?” she coaxed. Six months after my initial diagnosis, my sister Sharon had also been diagnosed with cardiomyopathy. But we were hopeful. Her heart was less damaged than mine and the odds were in her favor. One evening in April, Sharon and I met at the bookstore. We had coffee and joked about our bad hearts. We decided to write a book together called “I love you from the Bottom of My Ticky Tocky Heart.” We laughed and laughed. It was the last time I ever saw her. A week later she was dead of a sudden heart attack. I still miss her. I always will. As soon as I got home from the hospital, both the washer and dryer broke down. Mike and I went to the Laundromat. Up until then there had been no time to process the events of the week. There, in the Laundromat, it all caught up with both of us. Every worry, every fear, large and small, crouched in that grimy room. The cardiologist, while encouraging, had been straightforward. He talked to us about the future, about a transplant, or a mechanical heart. “We’re not there yet,” he emphasized, “but it’s down the road.” He was telling me to get ready. I still had options, but this had been a serious setback. Although it was late when we returned from the Laundromat, I wandered restlessly around the house. Finally, I went outside in my pajamas. A thick fog was rolling in from the wetlands. I scanned the sky, but the moon was hidden from view. The next day my son would turn eighteen. On Sunday he would graduate. I was grateful to be here to bake his birthday cake, to celebrate his graduation. Mike said we just have to take each thing, good and bad, as it came and keep going. I knew he was right and I made a silent promise to do this. But at night I watched the sky and listened to the wind moving through the trees, waiting for what would come next. I saw the three moons again, at three a.m. on a beautiful June night. The moons were not full this time. They were three-quarters full. They looked like three cookies with a bite nibbled out of each. I knew I should go back to bed, because the next night I was scheduled for a sleep study and, thereofore, expected to get little or no sleep. But even so I stood in the bathroom for a long time, watching. When he was finished, I went to the bathroom and looked at myself in the mirror. My hair stuck out wildly in all directions, pasted into clumps with the glue-like gel. From all over my scalp, batches of colorful wires sprouted and more wires dragged on my already baggy eyes. Under the harsh, florescent lights, my face was white. I looked demented. Finally I was settled in bed, David was monitoring me from the next room. I lay in the dark, windowless room. It was the darkest dark I had ever seen. And disturbingly quiet. I longed to hear the sounds of teenagers in the kitchen, giggling and making brownies. Sweetie’s dog tags jingling as she trotted around. The murmur of a television turned low, or the rhythmic throb of a bass guitar. It was one thing, I thought, to share a room, or even a bed, with another person, listening to whatever nocturnal noises they might be prone to. But here I was, in bed, in this mock hotel room, wired up like a puppet and somewhere beyond that wall a stranger was watching and listening. In my logical mind, my sane mind, I knew he was watching a series of monitors, keeping track of my heart rate, my breathing, my REM sleep. But the less than rational part of my brain had other ideas. Could he read my thoughts? What if he could see everything that was in there? Are the dark thoughts all sharp edges, etched on my brain like the jagged peaks and valleys of an EKG – here a pain, there a loss, and buried far down, shame and fear? I pushed those thoughts away and summoned happier times. Somewhere in my head, or my heart, or maybe my soul, are the good memories, a whole lifetime of them, like a field of wildflowers. Memories of making cookies in my grandmother’s kitchen on a fresh summer morning. Bells on my ice skates. My baby’s first laugh. The piney scent of a Christmas tree. Violets hidden in the grass and morning glories on the trellis. The way Mike looks at me. The awkward hugs of adolescent children. The sound of my family, back home in Michigan, eating pie and drinking coffee and laughing. My mother, playing the piano, a sound which, I think, is etched into my very bones. Floating in the lake, with my father. A warm bath and clean sheets. Giggling toddlers. Starry nights and gentle rain on the roof and the first snowfall of winter. Rowboats and people singing and evenings on the front porch on Fourth Street. Everyone home for dinner. I fight to regain my shaky health, but this time it feels more difficult. The hill seems steeper, the struggle harder. Perhaps this is because I am older, or because the drugs that are keeping my heart going are also triggering the depression and anxiety that lurk behind every door. I don’t tell anyone how I feel, because I don’t want people to think I am giving up. I go to work, I cook dinner, I keep whacking away at the piano, and at writing. At bedtime, I lie next to Mike and feel safe and comforted, but sometime, in the deepest part of the night, I wake up and think, I have to try harder. I have to get everything under control and buttoned down, because what if this time it doesn’t work? Once again I am trying, by sheer force of will, to get well. But I am haunted by the fear that I might fail. I still have options, I still have hope, but I am tired. I am grateful for what I have been given, but I am greedy. I want more time. I woke at 4:30 this morning. The bathroom was bright with moonlight and there, once again, were the three moons. The bathroom seems like a peculiar place to contemplate one’s mortality. Then again, maybe not. Maybe it is in the bathroom, at 4:30 in the morning, that we see who we really are. Are the moons a bad omen, as I thought in the spring? Or are they lighting the way in the darkness? I know I only have this moment. And then, like the moonlight, the moment moves on. Susan Gower is a freelance writer. Her work has appeared in magazines, newspapers and literary journals, including Woman’s Day, Good Housekeeping, and Talking Stick. She lives in Luck, Wisconsin, with her husband Mike. This entry was posted in Archives, Essay and tagged winter2016 by Mary Akers. Bookmark the permalink. I really truly enjoyed this essay. I hope that your health continues to improve and that as it does, the fear and anxiety subsides. Thank you for sharing your experience with us!